Every spring, cherry trees all across Japan explode into soft shades of pink, making it one of the most beautiful (and popular) times to visit. The landscapes become irresistible for both travelers and locals alike. It seems like everyone is out enjoying walks in the park, picnicking under the blooming trees and happily capturing nature’s beauty with their cameras. Cherry blossom season is a time of celebration in Japan. What I loved most was seeing how enthusiastic the Japanese were, how much they appreciated the blossoms (sakura), even though this is something they get to experience year after year. Seeing the Japanese enjoy the sakura so much reminded me of the importance of not taking nature for granted and celebrating the beauty of your home country. For our 2 week trip to Japan, we timed our visit to coincide with the cherry blossom season. It took some careful planning, and a lot of finger crossing, but we were lucky enough to spend 3 days in Kyoto during full bloom. Kyoto was a wonderful city to experience the cherry blossoms at their peak! There are so many great cherry blossom viewing spots in Kyoto. Parks, paths, temples- all were places we spent time admiring Kyoto’s cherry blossoms. With so many great places to see cherry blossoms in Kyoto, it can be hard to decide where to go. Rest assured, almost anywhere you go in Kyoto, you’re sure to see some fantastic cherry blossoms! With only 3 days in the city, we of course didn’t make it to all the best cherry blossom viewing spots in Kyoto. We did, however, find a few great locations for enjoying the sakura. Here are our six favourite places to see cherry blossoms in Kyoto! The Path of Philosophy is a scenic route that follows a cherry tree lined path along a small canal, at the base of the Higashiyama (Eastern Mountains). The path is named the Philosopher’s Walk because Kyoto University philosophy professor Nishida Kitaro (1870-1945) walked this path daily, using it for meditation. There are some cafés, shops and temples along the route but the main attraction is definitely the cherry trees! Even though the Philosopher’s Path is extremely popular during cherry blossom season in Kyoto, it was still a very special experience to walk in the shade of the beautiful cherry trees. Based on all the people and events we saw going on at Maruyama Park, I think it’s safe to say that the park is Kyoto’s most popular cherry blossom viewing spot. There is a huge weeping cherry tree that takes centre stage in the park and wow, is it ever pretty! All around the tree, on the perimeter of the paths, there were food stalls set up like a small festival. 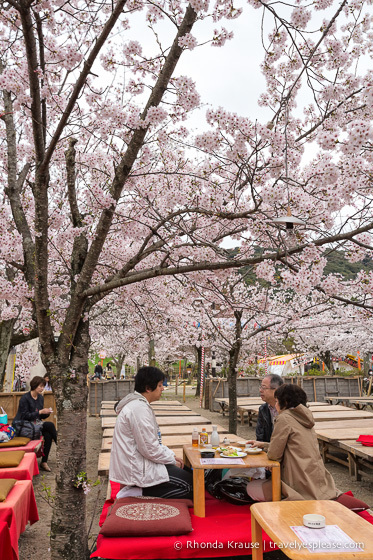 Maruyama Park is a great place to see hanami parties (blossom viewing parties) in action. People come to the park and lay down a tarp or blanket under the trees for a picnic, or just to hang out for the day. Shimbashi is not to be missed if you are in the Gion district, as it’s one of Kyoto’s most attractive streets. My guidebook even went so far as to call it “the most beautiful street in Asia”. Yes, Shimbashi street was indeed beautiful! Cherry trees lined the street, creating a canopy of blossoms over the sidewalk. A small stream flowed down one side that was lined with wooden buildings, some housing fancy restaurants. Shimbashi street is a popular place for locals to come and have their picture taken during cherry blossom season. I loved seeing the parade of gorgeous kimonos! There was a timeless feel to the area that was hard to deny. Shimbashi street felt very graceful, an absolute pleasure to walk down! Near the end of the street, where the blossoms almost formed a tunnel over the path, we found a nice café to have lunch at. We sat outside and ate under the cherry trees, admiring the young couples that would stroll by dressed in their traditional clothing. The tunnel of cherry blossoms on Shimbashi street was so picturesque and romantic, making it my favourite cherry blossom spot in Kyoto. To-ji Temple is another great place to view a large weeping cherry tree. It is especially beautiful at night when illuminated by flood lights! The weeping cherry tree may have captured most of my attention, but there were plenty other cherry blossoms to revel at on the temple’s grounds. A nice viewing point for cherry blossoms is from the terrace of Kiyomizu-dera Temple. There are quite a few cherry trees planted on the slopes surrounding the temple, as well as around the pond near the exit. Arashiyama is a lovely district on the outskirts of Kyoto, about 8 kms west of the city centre. There is a lot of natural beauty here, especially when it comes to cherry blossoms! North of the Togetsu-kyo “moon-crossing” bridge, the mountainside is thickly covered with cherry and pine trees, creating a picture-perfect backdrop for the Hozu River. If we had more time, we would have loved to rent a little rowboat to enjoy the blossom covered hills from the water! The hilly landscape reminded me of what we should have seen in Yoshino, had we been there during full bloom. You’ll also find a nice variety of large cherry trees at Tenryū-ji Temple, another gorgeous location in Arashiyama. So, now that you know some of the best places to see cherry blossoms in Kyoto, you’re probably wondering when is the best time to see cherry blossoms in Kyoto. The cherry blossoms in Kyoto usually bloom during the last week of March with full bloom occurring sometime during the first two weeks in April. According to the Japan Weather Association, the historical average blossom opening in Kyoto is March 31 and average full bloom is reached April 7 (I’m not sure how many years this average was based on). Of course the blooming dates can vary from year to year, usually by plus/minus one week, as it depends a lot on the weather. Typically, if the weather is mild during the weeks before the cherry blossom season, the trees will bloom early. Colder weather causes the blossoms to open later. Once the first blossoms open up, full bloom is usually reached in about a week. A week later, the blossoms already begin to fall from the trees. Unfortunately this means that the cherry blossom season is quite short! Keep in mind though, that not all trees in a city will open on the same day so there can be some variance in the cherry blossom season even within Kyoto. Timing your visit to coincide with cherry blossom season can be very tricky and requires a lot of research to increase your chances of seeing the sakura. I used a couple websites to read up on historical blooming dates and follow the cherry blossom forecast. Two good ones are Japan-guide.com and the Japan National Tourist Organization. Since it’s hard to predict exactly when cherry blossoms will be at their peak, it’s best to stay as long as possible in Kyoto if you really want to be sure you see the blossoms at their best. However, this can cost a small fortune! Kyoto can be extremely busy during the cherry blossom season, so we recommend booking your accommodations months in advance in order to secure your preferred location and price point. Be prepared to spend quite a bit more on accommodations in Kyoto compared to other cities in Japan during cherry blossom season. For your convenience, here is a list of hotels in Kyoto. Please consider booking your Kyoto accommodations through the included link. It costs nothing extra and helps support this website. Thank you!